Whilst western governments, and especially the UK, have neglected to make themselves aware or even recognise the potential of vermiculture as a significant contributor to food security and soil health the government of the Philippines is going so far as to financially supporting the industry. The government of the Philippines is not without its criticisms, but when it comes to worm farming there can be no question of its commitment to the development of regenerative farming practices. The 7,641 islands of the Philippines, famous for surfing and idyllic beaches, is trailblazing a worm farming culture and is home to the largest worm farm in Asia – Kahariam Farms produces 400 50-kilo bags of vermicompost a day. Last year the Government purchased 30,000 bags of vermicompost from Kahariam Farms to be distributed to farmers for free. The Government actively promotes and empowers the industry by providing training and worms to small scale farmers, they then purchase the vermicompost from farmers and give it back to the farmer for use on his land for free. The scheme is revolutionary and enables the farmer to break out of the cycle of dependence on chemicals. Since the “Organic Agriculture Act of 2010” the nation is moving forward and in 2017 one hundred mayors joined forces to form ‘The League of Organic Agriculture Municiplaities and Cities’ (LOAMC), banning GMOs and agrochemicals from their districts with offenders facing fines and imprisonment. The LOAMC comes as a response to the devastating aftermath of the introduction of GMOs and poisonous agrochemicals into the farming community, which consequently led to overwhelmingly high incidents of cancer, contamination of water sources and the degradation of farm land. Furthermore, agrochemicals come at a high cost to the farmer with conventional farmers typically spending 70% of their income on synthetic inputs. Communities and individuals are rising up against GMOs, and vermiculture consultant Michael Cagas is one of the nation’s leading lights. Michael collaborates with government agencies working tirelessly to support farmers to make the transition to organic practices and is succeeding by reducing the cost of inputs for farmers of more than 50 % from 24,000 pesos (£100) per hectare to 11,000 pesos (£45) per hectare. An accountant by training, Michael stumbled upon his organic career by chance after helping his friend write a business plan for his worm farming operation. To show the economical potential Michael established a demonstration worm farm with 3 kilos of African Night Crawlers which multiplied to 45 kilos in only three months. Michael is a pioneer and social entrepreneur, supporting the livelihoods of 387 worm farmers, whom he has trained to produce worms for distribution around the country. 70% of these worm farmers are women and 20% are senior citizens providing a much needed source of income. 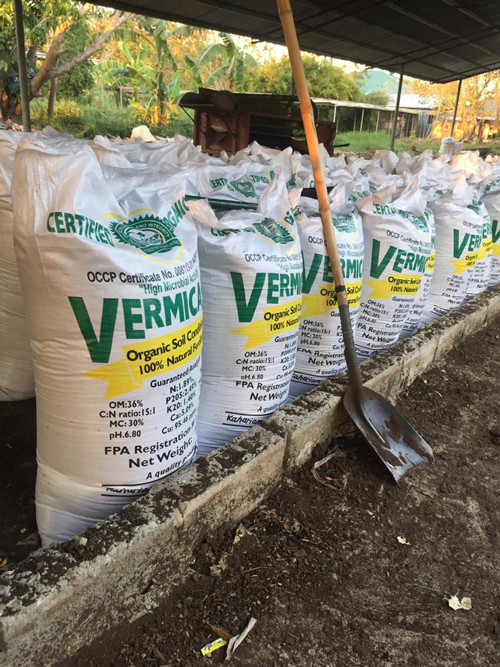 In the district of Bicol alone the Department of Agriculture purchased 2700 bags of vermicompost (135 tonnes) and 900 kilos of worms for distribution to farmers. 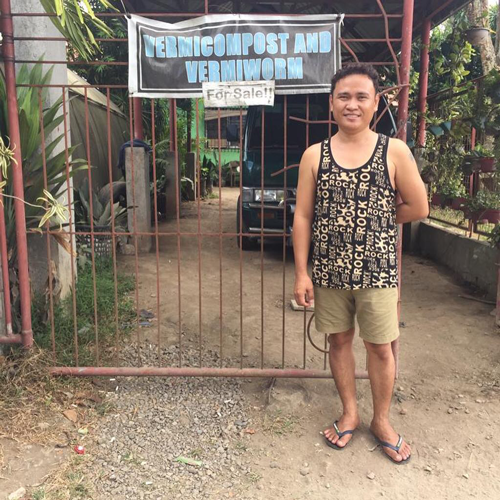 The growth of the vermiculture industry in the Philippines is providing opportunities for sustainable livelihoods and is contributing to the regenerative agriculture movement. 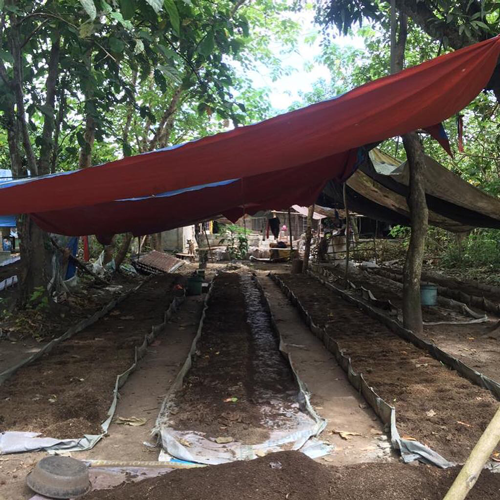 The culture of worm farming in the Philippines is unique in its support from the Government but the nation have had to learn the hard way and are harnessing the power of worm farming to regenerate the land from the destruction of GMOs. The sweetest fruits grow in the harshest soil and this is certainly the case with the Philippines. Whilst progress is being made with governmental recognition of its vital importance for agriculture, the Philippines remains a fragile nation that bares the brunt of extreme poverty and climate change, with increasing incidences of typhoons and water scarcity. Sovereignty and livelihoods are threatened as climate injustices are imposed upon the poorest country in south east Asia. We have a global responsibility to act on climate change and as individuals one small act of feeding your kitchen waste to worms is a step in the right direction. Feed the worms. Anna’s research trip to The Philippines was part funded by the Department for Trade & Industry and Heathrow Airport.